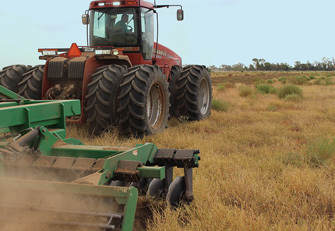 A tillage contractor at Coonamble NSW, is yet another beneficiary of an agricultural success story, thanks to the Vredestein AG tyres he has recently fitted to his Case Steiger 385. 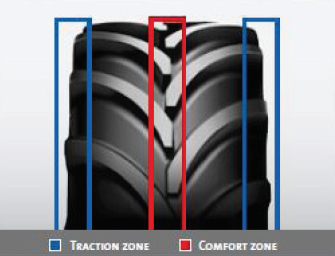 The comfort and traction zone’s shown above are unique to all Vredestein Traxion patterns, and are the reason for the exceptional comfort and traction that this contractor has been experiencing. “A more comfortable ride and better grip than the original tyres ever had.” He says the main advantages he is now finding with these new tyres are “more power to the ground and better grip… and not as much slip. It is more comfortable in the cab than any other AG tyres we have had…and it’s just easier sitting in the cab” he says. This is because of the unique Traxion tread pattern which ensures optimal ride comfort and traction for every application. 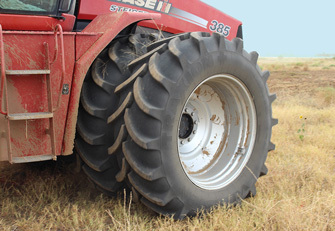 Backed up by an 8 Year Peace of Mind warranty guarantee, Vredestein are your ultimate agricultural tyre solution. The contractors Case Steiger 385 in action pulling a K-Line Speedtiller. Vredestein are the ultimate solution for this tough combination!